CedarBridge Academy and Berkeley Institute have joined forces to host a Gospel Extravaganza in aid of 35 students from both schools who will be travelling to the UK in March to tour Colleges and Universities. 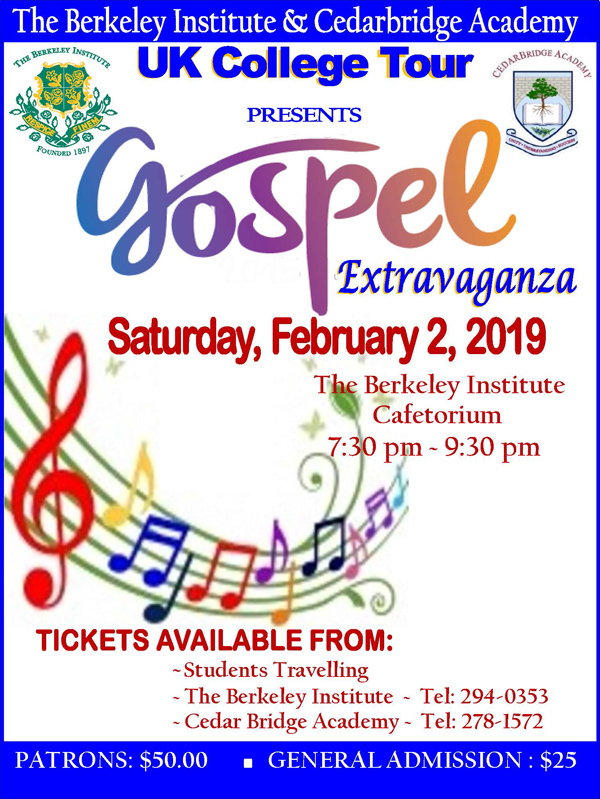 The Gospel Extravaganza will be held on February 2nd from 7:30pm until 9:30om at the Berkeley Institute Cafetorium, and will include performances by the Bermuda Institute Steel Pan Band, Berkeley Institute Choir Members, students of CedarBridge Academy, Anointed Steps Dance Ministry School, and Bermuda Teen Idol 2018 winner, Dakota Tucker, just to name a few. “Each year, a select group of students representing both senior schools, are invited to explore post-secondary options in the UK. One of the significant events this year is that students will attend the UCAS Exhibition,” a spokesperson said. “This exhibition is one of the largest events in the UK that hosts hundreds of university representatives and professionals and allows students to receive application advice, attend seminars, and discuss their plans directly with college reps and current students. “During the visit, students will have the opportunity to visit College and Universities in the Birmingham and London areas. Some of the schools include Birmingham City University, University College Birmingham, Hackney College and London-SouthBank university.